Pittsburgh, PA (August 24, 2011)—There was a lot to celebrate at Clique Vodka’s One Year Anniversary party at the PPG Aquarium. After just one year, Premier Innovations Group has grown the brand to three states: Pennsylvania, Tennessee and West Virginia. Over 500 close friends, family, clients and investors filled the PPG Aquarium to celebrate all of the success thus far, and to support what is to come. Our lead mixologist, Tara Shinn, created specialty drinks for the occasion, which included: “The Sharktank” martini, “Key Lime Pie” shots, a strawberry rooibos puree cocktail, a blueberry thyme puree cocktail and a full infusion bar with “Ginger Lemondrop” vodka and “Cucumber Cooler” vodka. DJ Jspin and DJ Xavier provided music for the occasion and it wouldn’t be a party without a photo booth, provided by Sweet Pix Photo Booths. People were everywhere, surrounded by exotic fish, sharks, stingrays, and the like. It provided a great atmosphere for this larger than life party. Premier Innovations Group is looking forward to the success, growth and years to come in the wine and spirits industry. “We were fortunate to have an amazing year filled with incredible growth. I am very proud of our team and their conviction to our brands and sacrifices they made with a strong commitment to our company. It was an amazing first year with many trials and tribulations. We appreciate all of our supporters that help us get from a to b. Our best is yet to come.” –Noah Cohen, CEO Premier Innovations Group. Pittsburgh, PA (August 1, 2011)—Pittsburgh-based spirits importing company celebrates one year of Clique Vodka. It was only four years ago when the idea of starting a global spirits importing company came to fruition for Noah Cohen, CEO/Founder of Premier Innovations Group. “We are currently in an explosive growth period, out of seed and out of start-up after four years of long and hard work”, says Noah. 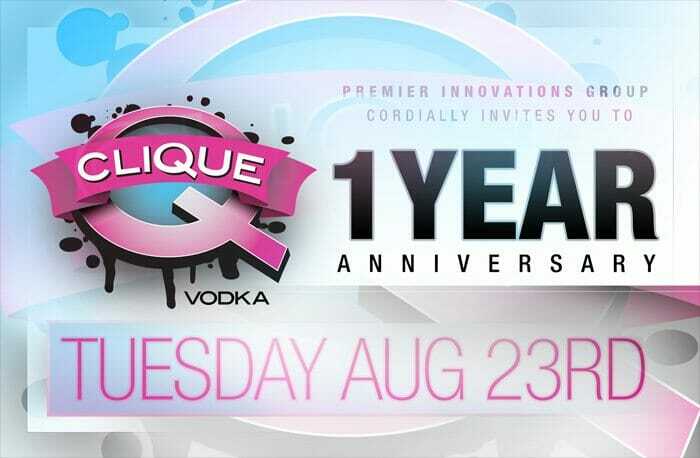 Premier Innovations Group’s first mid-shelf liquor brand, Clique Vodka, launched in July of 2010 in Pennsylvania. Since then it has expanded into Nashville and is ready to be launched in Ohio, West Virginia, and the first west coast market, Las Vegas. After Noah received his federal importing and wholesalers license, he structured the vision and cultural foundation of Premier with headquarters in Pittsburgh, PA. In May of 2007, Cohen began to structure the team that would bring the dream to reality. He brought on his former associate, Jimi Romanus, as the Vice President of Sales. He then continued his search for an event-driven promotional company that could help drive the product in local establishments while creating unique viral and aggressive marketing and branding campaigns to drive quick market penetration. That is when he met Frank Bachurski, Pat Hanavan, and Isaac Holeva, partners of Faded Industry Entertainment. It was a relationship that instantly made complete sense for everyone, and in October of 2007, Premier Innovations Group acquired Faded Industry Entertainment. They now serve as the in-house marketing, branding and promotional company behind brand development for Premier Innovation, starting with Clique Vodka in Pittsburgh and throughout the United States. “Faded Industry was the company that catapulted us to success in the entertainment arena of business. It was the stepping stone to something so much larger. When we were approached by Premier Innovations Group to become stockholders and officers of our own spirits brands, I knew that this was the once in a lifetime opportunity that we were looking for to launch these businesses worldwide,” says Frank Bachurski, Owner of Faded Industry/VP of Marketing Premier Innovations Group. They now also have a Philadelphia presence to promote Clique Vodka in the eastern region of the state. Once Premier and Faded merged, there was still one missing piece to the puzzle, and that was a graphic design resource. After meeting Joel Kamensky, of Primo Creative, it was apparent that this would be a great fit. Premier Innovations Group acquired Primo Creative in April of 2008. From that point on, this group of six men worked diligently to launch their first brand of spirits, Clique Vodka. The team took a group trip to Latvia to tour the vodka factory and was able to see hands-on how their product was made and produced. “There is no question that the quality and value of our product is first priority”, says Noah. They are currently in 170 Wine & Spirits stores across the state, and expanding into another 150 stores on the eastern side of Pennsylvania. After their first year, sales have tripled and the company continues to grow. They have added an in-house mixologist, a promotional model manager, and a public relations director, and have moved into their first office space in the Strip District. Premier Innovations Group also launched a mid-shelf Tequila last year, Don Pantaleon. Along with Clique Vodka, these represent their two current brands, with more in the pipeline of their brand assembly line. Premier Innovations Group has been in a constant growth pattern, and they are currently seeking potential investment interest to take Clique Vodka to the next level. There will be a one-year anniversary launch party on Tuesday, August 23rd at the PPG Aquarium at the Pittsburgh Zoo. If you are interested in attending the event, or would like a media pass, please contact [email protected].